A short break in the pretty Perthshire village of Fortingall, home of Scotland’s oldest tree the Fortingall Yew. Glen Lyon – home of the Fortingall Yew. Last weekend we were hit with that terrible first World dilemma – day trip or mini break? It doesn’t take a genius to work out which option we chose! Early Saturday morning we bundled into the car with The Wee White Dug. We were Glen Lyon bound for an overnight stay at the dug friendly Fortingall Hotel in the pretty Perthshire village of Fortinggall. Having street viewed the hotel on Google Maps it ticked all of my remote location requirements – pretty scenery, tiny village and a single track road. With a 34 miles long glen to explore we were confident we’d find a great spot for hiking. We parked at Innerwick on the Meggernie Estate and checked a route map located in the car park. We decided to do the Cam Chreag route, an 8 mile hike up a Corbett and back. A Corbett is a Scottish hill between 2,500 and 3,000 feet high. Mr G insisted he’d seen the start of the route a little further down the road by a war memorial. I mentioned that the map seemed to suggest we were already at the start of the route but he was adamant, so off we marched in the direction of the war memorial. Guess what? The Cam Chreag route started back in the carpark – hmmm who knew! So, off we headed along the Kirk Road – a 14 mile route to Loch Rannoch and back. Our hike out of Innerwick was long and steep. Some might say never ending or relentless. I muttered and moaned about Everest, the North Face of the Eiger, Meru and all of the other big mountains I could think of. The boy found the skull of a long dead beastie on route and gave us his best Hamlet impression. “Alas poor Yorick, I knew him Horatio”! Once we’d scaled K2 the going was much easier. The weather gods were smiling on us too, and the rain forecast didn’t materialise. The wee dug was as happy as Larry amongst the heather and hills. It never ceases to amaze me how hardy terriers are. The boy might be knee-high to a grasshopper but he’s a tough wee laddie. Our route got its name as church goers living in remote communities around Loch Rannoch once walked it to get to Glenlyon Church at Innerwick. A 14 mile round trip over hill and moor, in all-weather just to listen to the meenister – no thank you! After a few hours hiking across lovely, remote moorland we’d worked up a healthy appetite. We decided to stop for lunch at the popular Glen Lyon Tearoom at Bridge of Balgie. I wasn’t sure it’d be open in early April given the remote location. I needn’t have worried, it was open and hooching. Since it was a nice day we ate al fresco. Yay – our first al fresco lunch of 2016. Please let it be the first of many. We enjoyed home-made soup, sandwiches, ice-cold drinks and a good strong pot of coffee. Casper enjoyed some lean ham, tuna and a snooze under the table. All was good with the World. On our way back through the glen to our hotel we stopped at Roman Bridge for a few snaps. Known locally as Roman Bridge it’s actually far more recent, and probably dates to the 1700 or 1800s. Checking-in at the Fortingall Hotel we heard those magic words which people travelling with dogs rarely, if ever hear. “You’ve been upgraded” – yee hah. Our room was gorgeous – spacious, tastefully decorated and with pretty views of the glen. There was even a decanter with a little tot of whisky for us to enjoy. The Village of Fortingall has a very famous and very old resident – the Fortingall Yew. A tree believed to be the oldest living thing in Britain. It’s said to be 5,000 years old, but experts think it’s more likely to be somewhere in the region of 2,000 – 3,000 years old. Whatever the true age it’s staggering to think how long it’s stood there. Nine years my junior Mr G kindly pointed out that it was even older than me! After Mr G’s age jibe I felt no guilt whatsoever at delaying beer o’clock to drag him to the edge of the village to view some standing stones I’d spotted. There were three stones still standing on a site which once compromised of three stone circles. Excavation has uncovered fragments of pot and cremated human bone by one circle. Other than those small nuggets of information the true purpose of the stones has been forever lost in time. I delayed beer o’clock further as I marched Mr G off to admire the quaint thatched cottages in the village. Finally, after a thorough exploration of the village I relented and let Mr G have his beer. The Ewe Bar at the hotel is a lovely, relaxing haven with a roaring log fire. Luckily we arrived as some local musicians were jamming. Two guitars, a fiddle and singing, they played a brilliant fusion of country and folk. A fruity red wine, roaring fire, live music and my two favourite boys – bliss. Dinner that evening was excellent. Mr G declared his steak the best he’d ever eaten. We rounded-off our night in the hotel’s lounge bar beside yet another cosy fire. It was perfect until another couple joined us and preceded to whisper loudly instead of speaking. It was weird and distracting! They seemed to be labouring under the misunderstanding that speaking out loud in hotels was strictly forbidden. Possibly they’d mistaken the hotel for a library?! We decided to retreat to our room for a nightcap, away from their deafening whispers. I braved the firewater in a vain attempt to develop at least a slight appreciation of my national drink. Mmmmmm burn, mmmmm this one is quite smooth, burn. How people drink the stuff without grimacing and wincing is beyond me. Mr G wimped out completely and had a beer – coward. Next morning after a fab breakfast we checked out. The boy was delighted to be fussed over and complimented on his dapper new Bowzos Harris Tweed neckerchief. Another excellent mini-break and top marks for dog friendliness and no hidden fees for dogs. 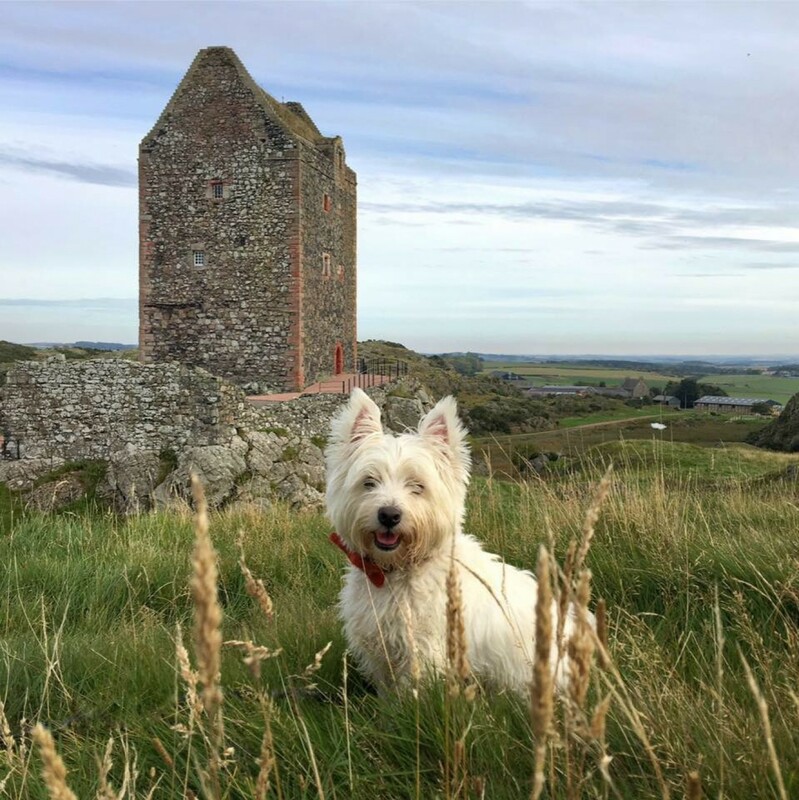 The Wee White Dug gives The Fortingall Hotel and Glen Lyon a big paws up. We do too.